All of our patients who choose to have cataract surgery will need to choose an intraocular lens implant, also known as an IOL. An IOL replaces the your natural lens which has become a cataract. Once the cataract has been removed, it must be replaced with a lens implant. This implant is usually a plastic polymer very similar in nature to a contact lens. This clear lens implant will replace the focusing power of your natural lens, but give you much clearer and brighter vision compared to the cataract. Here are the different cataract lens implants which we offer. We realize that there are many choices and deciding which lens implant can be overwhelming. During your consultation with any of our board certified eye doctors, we will discuss which options are best for you. Not every implant is appropriate for every patient. We will customize your choice of IOL to best meet your vision needs and expectations. The traditional “monofocal” lens implant is the gold standard. Monofocal intraocular lenses have been used in cataract surgery for several decades. 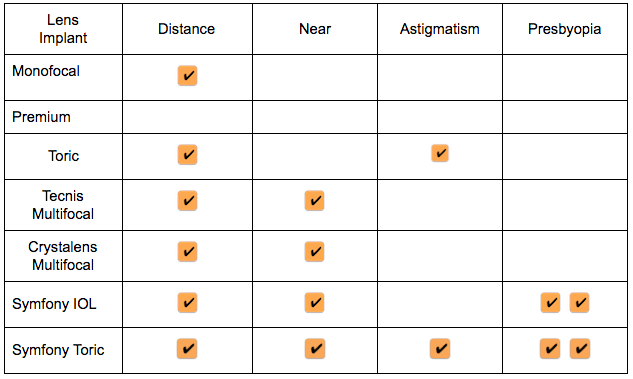 The standard “monofocal” lens implant corrects only for distance vision only. Patients who choose this IOL can expect to need reading glasses/bifocals after cataract surgery. Your health insurance likely covers this type of replacement lens for patients requiring cataract surgery. We offer a wide array of premium implants. Premium implants offer advanced technology to correct for near vision loss, presbyopia and/or astigmatism. Many premium IOLs will require an out-of-pocket fee compared to standard cataract surgery. We will help you clarify your insurance concerns during your visit. We are one of the first practices to offer the Symfony lens implant to our patients including Millville, NJ, Bucks County and Burlington County offices. We are impressed with the visual results in our patients who have had the Symfony implant to correct both their cataract and near vision loss! The Symfony lens implant is the only cataract lens implant FDA approved for patients with both cataracts and presbyopia. These lens implants are great for patients with low to high degrees of astigmatism. The lenses correct for both distance vision and neutralize or decrease the amount of astigmatism which adds to blurry vision.